Do I need my Aussie passport to travel ? Hopefully you can help with a minor passport issue.. .. .. ..
1. I am a british citizen who has been in Aus for about 8 years. 3. I have permanent residency in Australia. 5. But I haven't got round to getting my Aussie passport yet. 6. Next Tuesday I am off on a RTW for seven weeks. - I am aware that I SHOULD be travelling in and out of Australia on an aussie passport. - But I haven't got it yet. - Do I NEED to have an aussie passport or is it ok for me to travel on my British passport (still containing my permanent residency thingmy) ? - Technically, I could have a problem. - But practically, they have no way of knowing and I will not have a problem on a British passport. You will have trouble using the British Passport and , if you read the documentation that you should have received, does state that except in some specific circumstances , you need to enter/leave Australia on an Australian passport. Many thanks for your help - it's much appreciated. I may be missing something, however, .. .. ..
- how will the airline know that my visa has been cancelled ? My permanent residence visa is still in my british passport and is still unmarked so I'm not sure how they can deny me boarding. Let me know if I'm missing something. - You mentioned that they will know about my citizenship because it's on my DIMIA record. I had always assumed that the immigration guys in Sydney were only checking that your passport had the visa and maybe photocopying it on that machine. I may be wrong - are they actually scanning the passport and cross-checking it with various databases (DIMIA or DIMA, criminal records, etc, etc) ? Get an Australian passport. Stat. Trvelling on a wrong passport is an offence and will mean you will likely be banned. DIMA can do urgent passports but you must act now. BTWE, why on earth did you take so long to find this out? Thanks to all for your help. I took Dave's advice and called DIMA. DIMA told me I could 'legally' travel on the British passport as long as the permanent residence visa had not expired (their words not mine). They also told me to check with immigration. - If my permanent residence visa was still valid I'd be able to get back in ok.
- I may get a few questions and there may be a discrepancy in their records but this wouldn't be a major problem. I was a bit cautious and they said that if I was concerned I should take my citizenship certificate with me too. .... why did you bother swearing allegiance to the Queen a second time when you had a perfectly suitable RRV on your British passport? My RRV has expired and I am heading off O/S at the end of the month, so I looked into getting an "Oi, Oi, Oi" passport. Once I did the maths it worked out that I would be in the grave long before I broke even, so I gave the idea away and renewed the RRV. In any case, it would have been hypocritical of me to sign on when I take every opportunity to disparage Australian nationalism, foreign policy, and general lack of global humanity. I think I harped on about this before but the thread seems to have mysteriously disappeared. Or am I being paranoid? And of course Charles will actually become King George VIII when he ascends to the throne.. sorry bit off-topic there..
Also, the government could change the eligiability rights to maintain residency. Not to mention the increasing circumstances of the current Government choosing to deport non-citizens, including permanent residents, on 'character grounds'. This is why I appreciate that I have the privilege to vote. Those who choose not to vote, can not validly criticise the government of the day. Actually, she is Elizabeth the first, and he will either be Charles the first or George the third (or possibly the fifth - depends which way you look at it) when ascending the throne. Remember they are the monarch of Australia - not the United Kingdom, over here! Reginal counting really either started at settlement or formation of Federation. Where in the Australia Act does it say that the title of the Queen is changed? I wasn't aware that there was a different formal address for the Queen for Australia to the one I gave above? The address does refer to her being "Head of the Commonwealth"
I have heard that you have two options when taking the pledgie, and one of them delicately skirts around the fact that the head of the Windsor family (that motley bunch from Buck Palace) is also the Australian head of state. Yes, but I would forever more be paying for two passports, as only a complete fool would give up unfettered access to Europe. I have voted in every Federal, State, and Council election since I was 18 (I arrived here before 1984 when they decided that Permanent Residents were good enough to pay tax, but not worthy of voting how it should be spent). Firstly, that the majority of these "leeches" would vote for Australia becoming a republic. Secondly, that the majority of the dumb-fcuk Aussies wouldn't. He wasn't amused when I was proven right on both counts. But I must be off now ... I see the Queen of Australia is about to open the Empire Games. Pledge include Bettie - no. However, from experience, I can confirm that God is an option. "From this time forward, [ under God ] , I pledge my loyalty to Australia and its people, whose democratic beliefs I share, whose rights and liberties I respect, and whose laws I will uphold and obey." You can get a passport same day...my last one took one hour. So why are you mucking about? She's opening the games in her capacity as the Head of the Commonwealth - India will host the games next time around and she'll open them as well, despite India being a republic. As for the Queen being the head of state, that's a debatable point nowadays. Try to find a statement in law saying she is the head of state. You can't - all you get are non-judicial opinions. More relevently,, imo, can you find anything that states that she has ever ceased to be head of State since obviously, the monarch has been head of state ? The Constitution of Australia defines the Parliament as "the Queen, a Senate, and a House of Representatives" and vests the Federal legislative (law-making) power in the Parliament (section 1, Constitution). The executive power (the governing and administrative power) of the Commonwealth of Australia is vested in the Queen (section 61, Constitution). "A Commonwealth realm is a country where The Queen is the Head of State. The Queen is Queen not only of Britain and its dependent territories, but also of the following realms: Antigua and Barbuda, Australia, Bahamas, Barbados, Belize, Canada, Grenada, Jamaica, New Zealand, Papua New Guinea, St Christopher and Nevis, St Lucia, St Vincent and the Grenadines, Solomon Islands and Tuvalu." it doesn't seem to be a debatable point to me. More relevently,, imo, can you find anything that states that she has ever ceased to be head of State ? That would be difficult, as there has never been anything in legislative or common law saying she was the Australian head of state. The term is not used in the Constitution, nor any other Commonwealth Act. The High Court has never been asked the question. I take your point, and certainly up until quite recently nobody would have thought that she wasn't the head of state. But just as somewhere along the way the United Kingdom became a foreign power, the role of the Queen has diminished. The Prime Minister doesn't think she's the head of state, for example. The Queen's website can imply that she's the head of state. It doesn't make her so. Only Australian law can define who is the head of state, and it doesn't. 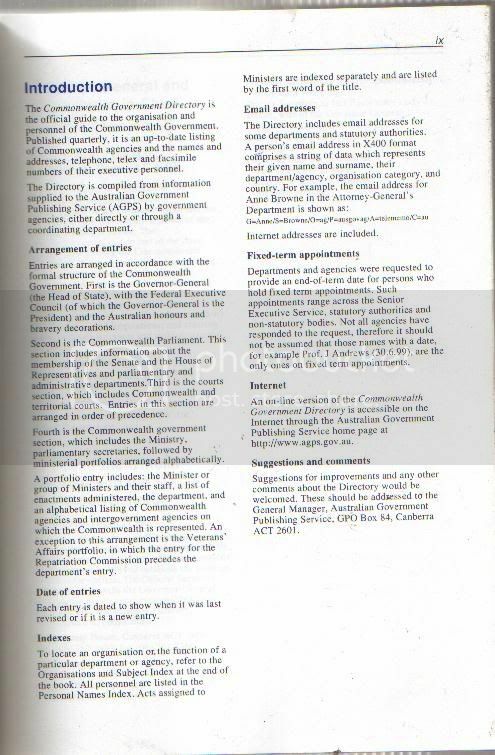 I've got a copy of the Commonwealth Government Directory for March 1997 stating that the Governor-General is the head of state. It's debatable. The Monarch was never actually defined in law as the Australian head of state. People just assumed she was, but as we have seen with the UK being defined by the High Court as a foreign power, things change. Nor does the Queen actually state that she is the Australian head of state. Her website implies it, but such an indirect reference can hardly be taken as a definitive constitutional declaration. India is a member of the British Commonwealth and the Indian president is the indisputable Indian head of state, so no, British Commonwealth members don't need the Queen as head of state. The Constitution states that the executive power is vested in the Queen (whatever "vested" means), but as all the powers commonly associated with head of state are directly given to the Governor-General and cannot be exercised by the Queen, it's difficult to see what remains to her of this notional executive power.